A new report recently released by multinational energy management corporation Schneider Electric, reveals not only the tangible benefits of implementing digital transformation into energy management and automation of businesses globally, but its broader importance in helping solve some of the world’s biggest problems. The Global Digital Transformation Benefits Report 2019, which looked at 230 of Schneider’s own customer projects in 41 countries over the last five years, first looked at how digitizing businesses in various industries, commerce and public sectors, has a positive effect on capital expenditures and operational expenditures, as well as on sustainability, speed and performance. Digital transformation – which can include the adoption of digital technologies such as IoT and automation devices to create efficiencies, enhance customer experience and change business models – is often seen by businesses an an expensive proposition. Many business and organizations still use legacy technologies or operate in industries with complex, ever-evolving technology ecosystems. These points, according to a survey by Schneider of chief information officers, are the primary barriers in implementing digital transformation in their companies. 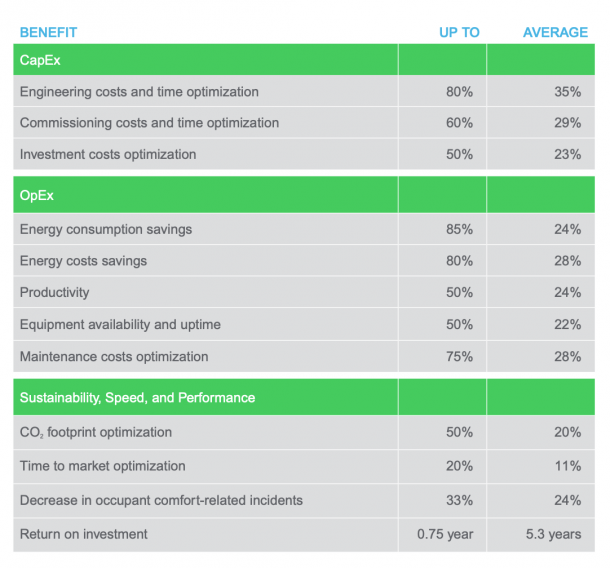 However, the study shows that digitization of engineering processes (such as construction costs and managing teams of subcontractors), can save businesses an average of 35 per cent in CapEx costs and time optimization. “Digitizing the engineering phase enables centralized integration among projects and systems, thereby streamlining the work,” the study states. Commissioning costs have also been reduced by an average of 29 per cent. The use of “open, interoperable, and IoT-connected devices,” the study points out, can communicate and integrate with old and new systems speeding up the commissioning process. Implementing digital transformation can also extend the life of equipment by using it to constantly monitor for issues, creating further efficiencies. Operational expenditures, on the other hand, can also be greatly reduced with digitization, the study shows. Efficiency, reliability, safety, and sustainability are improved with the use of IoT devices, with businesses reporting an average savings of 24 per cent in energy use. Yields are higher with less energy, fewer materials and less work hours. “Increased productivity, up to 50 per cent, results from energy management and automation efficiencies across the value chain, from IoT-enabled tracking to automated production lines. Screengrab from The Schneider Electric Global Digital Transformation Benefits Report 2019. Buildings, it turns out, account for 36 per cent of all global final energy use and 39 per cent of carbon emissions. But using a combination of energy management, automation, and IoT – such as energy management, app-based thermostats and environment controls, automated lighting and the like – operating buildings can be much more environmentally friendly. The study also cites how climate change and a growing population will put an extreme strain on infrastructure. The conundrum is that it will need to grow, but emissions will also need to shrink. How is this possible? Through digital transformation. Smart grid electrical power systems for example, are key to this, like the one mentioned by Canada’s Minister of Innovation, Science and Economic Development, Navdeep Bains, as he announced the new partnership with Siemens Canada, New Brunswick Power and Nova Scotia Power at the World Economic Forum last month. “The smart grid, perhaps the most intricate ‘machine’ ever made, is home to billions of components (e.g., electric meters, transformers, capacitors, phasor measurement units, and power lines) that are now being brought under the control of a centralized digital architecture,” the study describes it. The Schneider report continues in detail, but the main point is clear – digital transformation is revolutionizing industries across the board, allowing them to run more efficiently and more cost effectively, while also contributing to the bigger picture of helping save the planet.